But this guy pretty much 100% summaries my thoughts for me, right down to why previous attempts for me running android have failed.. and therefore saves me the trouble! Worth a read, whichever side of the fence you are on! Be careful if you use these configurations on a live system and do not simply copy and paste this configuration in to a running CME or UC500 system, check your dial-peers and translation rule numbers (“show run” is your friend) otherwise you might overwrite something you later come to regret! dial-peer voice 552 voip description **Incoming Call from LYNC** b2bua session protocol sipv2 session target ipv4:192.168.100.64:5068 incoming called-number .% voice-class codec 1 voice-class sip dtmf-relay force rtp-nte dtmf-relay rtp-nte no vad ! Nothing clever above, the IP address above is that of your Lync mediation server and the standard mediation server port (5068), keep an eye on the port number and ensure it matches up with your mediation server port if you changed it and do not simply enter 5060 because it is your UC’s SIP port. This port number is the number the UC talks BACK to your Lync server on. Although the above doesn’t appear to be mandatory as our UC still dialled a number coming out of Lync without this, we found that it was intermittent at best and we could no longer control things such as class of restrictions without it. The next step is to allow a user to call a user who is on the Lync platform, to do this is a little bit more complicated. To make the experience a little easier on the user (and you can’t easily dial a + on a Cisco phone) we are going to create a translation rule and link this to our dial peer. By creating this translation rule it will allow a user to dial simply 5xxx and the CME/UC500 router will automatically add the + to the extension as it exits the CME/UC500 system, remember Lync requires e.164 style numbers so this is going to give Lync what it wants. Be aware single number reach will not work with this configuration, my next blog post will be on how to co-exist with Lync using Cisco Signal Number Reach on the CME/UC platform. A translation rule consists of 2 parts, the rule itself and a profile that the rule is linked to, below is the translation rule and translation profile created on our system to make this work. Be aware you need to create the rule first before creating a profile. The rule below simply adds a + in front of anything dialled that starts with a 5 and is 4 digits long. voice translation-rule 4000 rule 1 /(5...)/ /+1/ ! This profile simply calls the above translation rule. voice translation-profile LYNC_ADD_PLUS translate called 4000 ! Now that we have create the translation profile and translation rule it is time to create a dial peer that will call the Lync server when a user dials 5xxx. Below is the live running configuration from our CME router, again be wary of the port as it needs to be the port of the mediation server. dial-peer voice 551 voip description ** SIP Trunk to Lync Core ** translation-profile outgoing LYNC_ADD_PLUS destination-pattern 5... notify redirect ip2pots session protocol sipv2 session target ipv4:192.168.100.64:5068 session transport tcp dtmf-relay rtp-nte codec g711ulaw fax rate disable fax protocol pass-through g711ulaw no vad ! Once you have done the above is you should now have a fully functional enterprise voice installation, ensure that you enable a user with Enterprise voice. 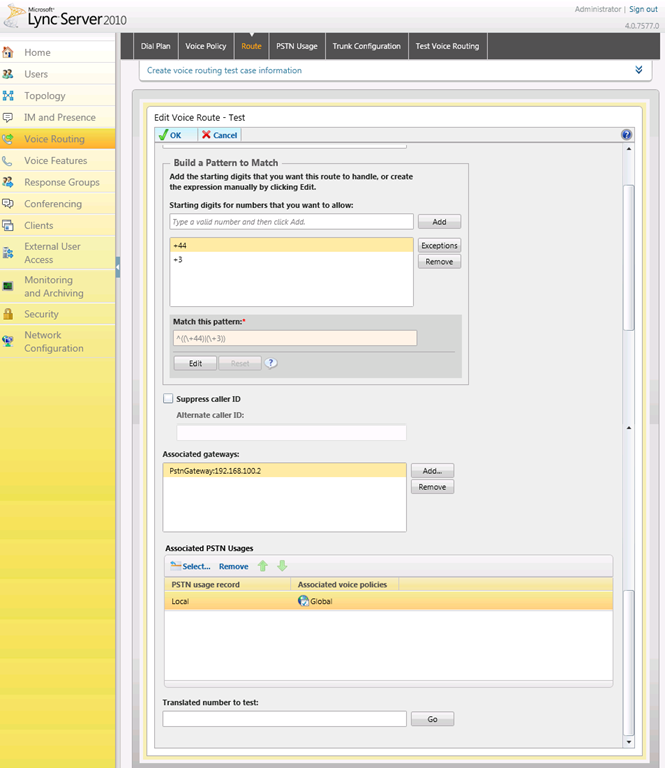 An example Lync user configuration is below, enabling Enterprise voice is simple just select the option. It is important to set the Line URI. In the example below I have configured the “tel:” to be my Lync phone number so in my example below it is 5346 and have also included my Cisco desk phone which is “6346” it is important if you use the extension that you do not add the + to the front of it. Adding your desk extension improves the Lync experience as Lync will recognise you from your desk phone when you dial in to things such as the conference centre. Until next time have fun with Lync and Enterprise Voice!! 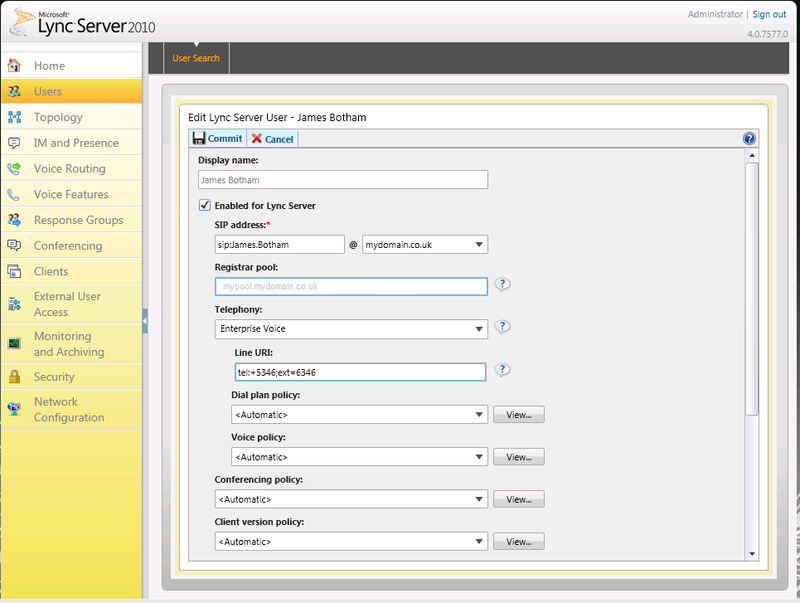 Hot off the press from Jamesbotham.wordpress.com, who kindly found the time to write up our Lync Integration efforts, this article will shows how to integrate Lync 2010 and the Cisco Call Manager Express to offer Enterprise Voice capabilities to your Lync installation. The installation has a 4 digit dial plan, all of our Cisco phones are in the 3… range and our Lync users are in the 5… range. We currently run a UC560 running CME 8.1 so have no access to E.164 support although 8.5 will have support and is coming to the UC500 soon. This document will allow the configuration without using this support so will probably be updated once I can play with 8.5’s E.164 support. 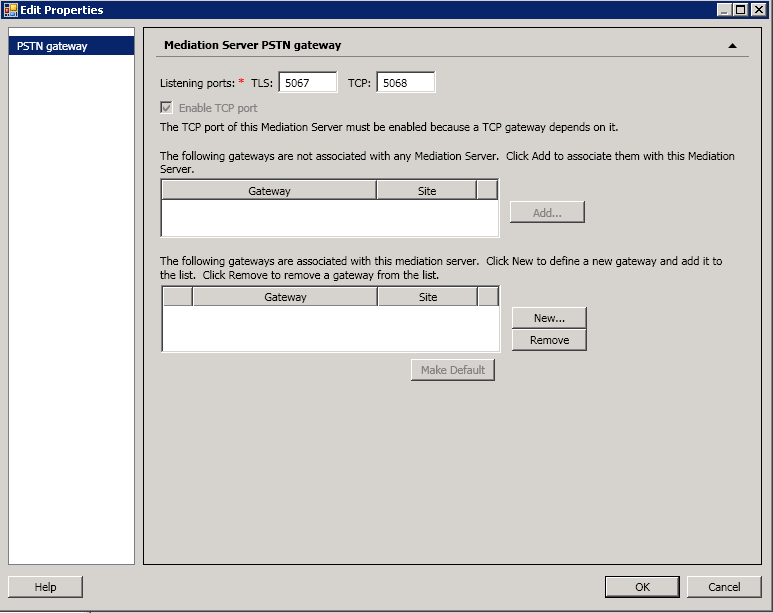 From topology builder we are going to create a new PSTN gateway, to do this expand your site Media Servers and then select your mediation server and select properties to open the following window. 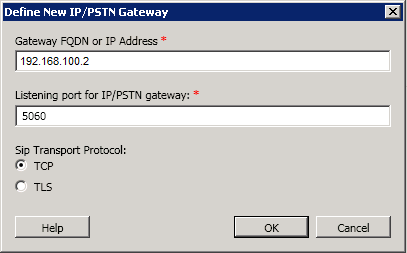 Select the option “New” to create a PSTN gateway, type in the FQDN if you have an A record setup for your phone system OR type the IP address in. Override the port from the default port to 5060 which is the standard port for SIP and CME’s default configuration, finally ensure TCP is set (TLS is out of scope of this document). Click OK and ensure you publish your topology to your environment. Create the first of our 2 rules, this rule will remove the +44 (UK dialling prefix, replace with your own if outside of the UK) from the beginning of the number dialled from Lync and replace it with a 0 so that the CME can understand the number we are trying to dial. Our final translation rules is designed to remove the + sign from the from our extensions as they are being dialled, again this is so that the CME can understand what we are sending it. Normalisation rules are used to try and form an E.164 number from the digits dialled by an end user, for example if you were to dial 01234 567890 from your Lync client the normalisation rule will turn this in to an E.164 of +441234567890 . Again we are going to create 2 normalisation rules, to create the first select “New” under the “Associated Normalization Rules”. This rule is going to allow us to dial a PSTN call through the CME device, we are looking for any number that starts with a 0 and is at least 2 characters long, once we have this we are going to remove the 0 and add +44 to form a valid E.164 number. Rule number 2 allows us to dial an extension on the CME, this rule finds and number beginning with 3 and is 4 digits long and appends + to it. Now that your configuration is complete ensure that you select Commit All to upload your dial plans back in to Lync. The final piece of configuration on Lync is to create a route from Lync to the CME, below is a working configuration that allows all numbers starting +44 and +3 to be sent to the CME. 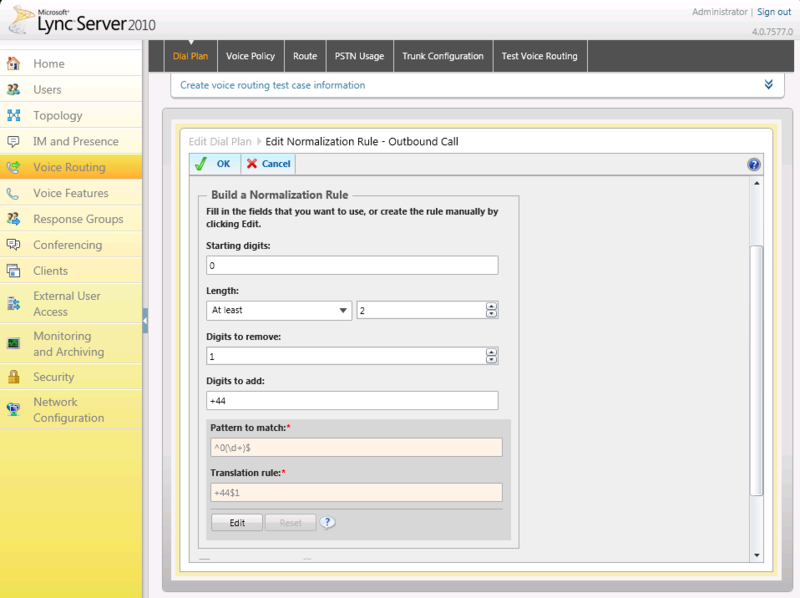 Ensure that you select the previously configured PSTN gateway as well as a PSTN policy. Now that the Lync configuration is completed, ensure you go to each section and ensure everything is committed. Once you have committed all of the changes leave your Lync installation, get a cup of coffee and let Lync simmer for around 10 minutes to ensure that everything has replicated around. 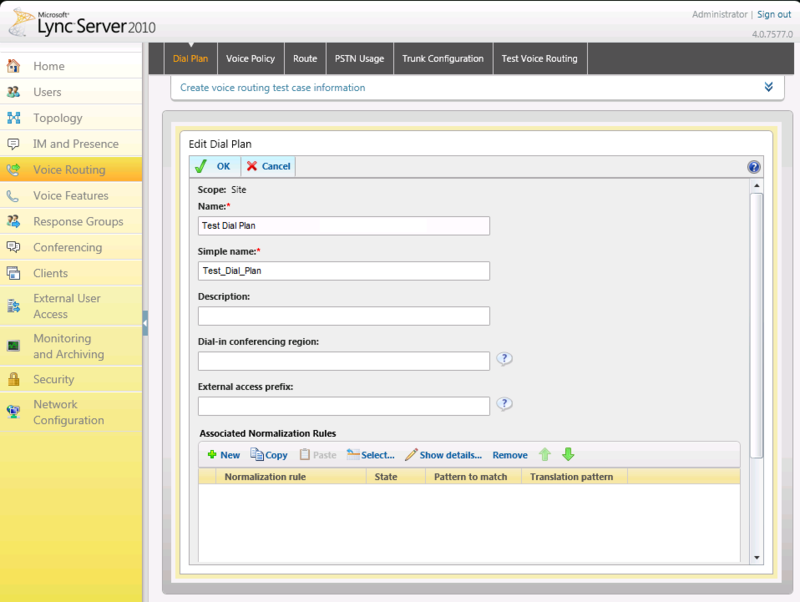 In Part 2 we will configure Cisco Call Manager Express to work with the above configuration. Part 2 either HERE or HERE.